The incremental name comes from the pattern of two contrasting woods incrementally getting smaller and larger from left to right and from right to left. For my board I chose to use the beautiful combination of walnut and maple. Using my neighbors jointer to first get one face and one edge of the boards nice and flat. Big thank you to my neighbor for being so gracious with his shop and tools. After flattening one face and edge on my walnut board I also did the same with my maple board. Then since I was already in my neighbors shop I went ahead and used his planer to flatten the other side of the boards. 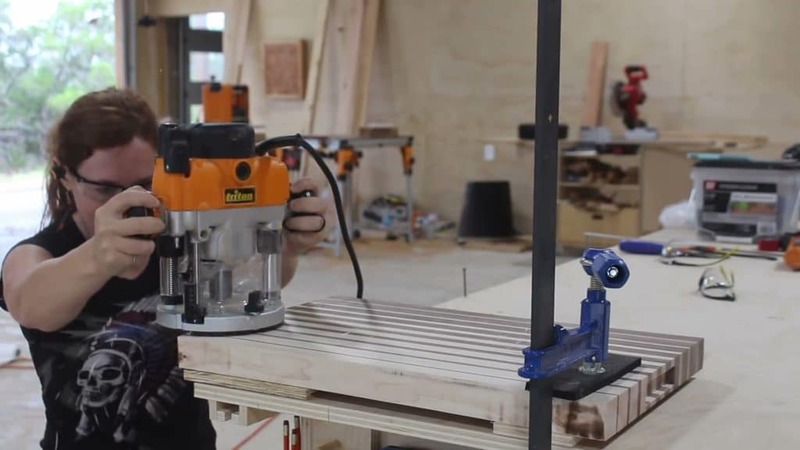 However at this point I could have ran these boards through my bench top planer to do the same. Getting the boards back to my own shop I figured out how long I wanted my cutting board to be, then added an inch and cut that length at the miter saw. That way my boards are roughly cut to size but I still have room to cut them to final length later. Before continuing, let me explain the two different cutting board options: end grain and edge grain. End grain is where you have the end grain facing up and down, for the cutting surface. 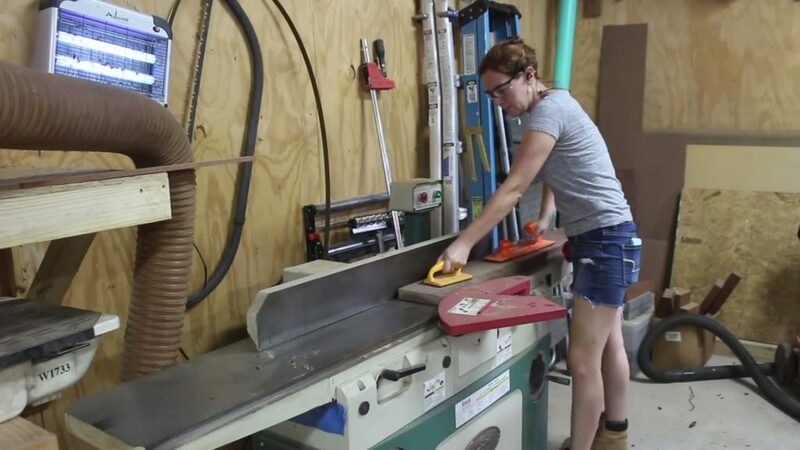 Edge grain is where you have the edge of the boards for the cutting surfaces. End grain is easier on the knives edge but edge grain boards are just so darn pretty. For my board I went with edge grain so I could do the pattern I wanted. 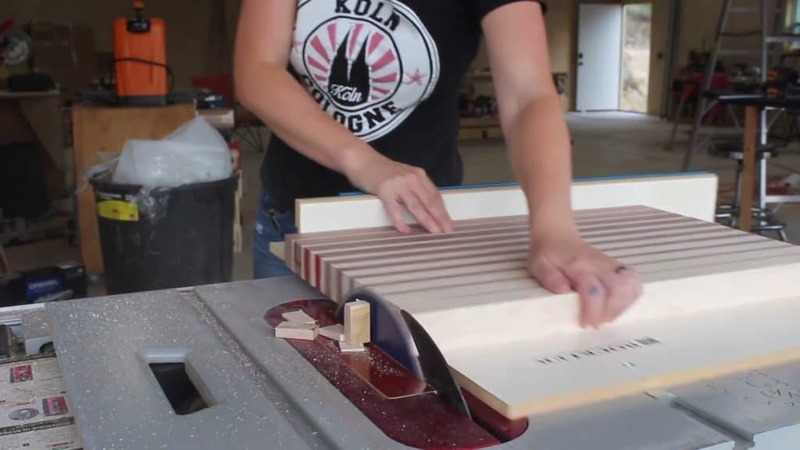 I took my boards to the bandsaw and started cutting them in strips. 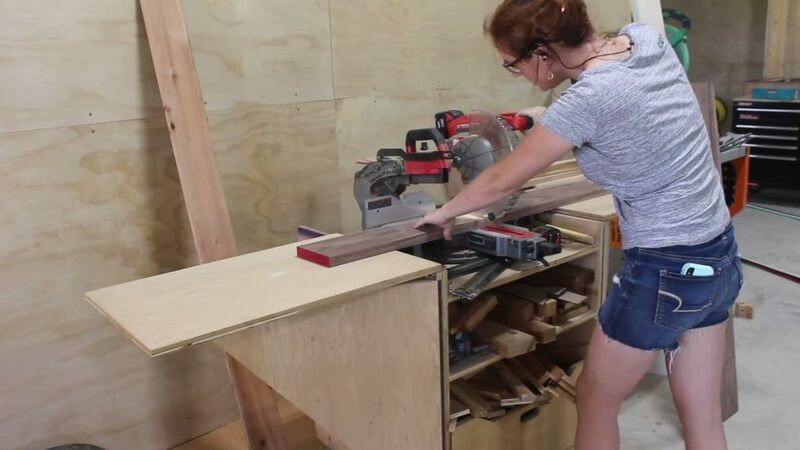 This dimension will ultimately become the thickness of the cutting board. 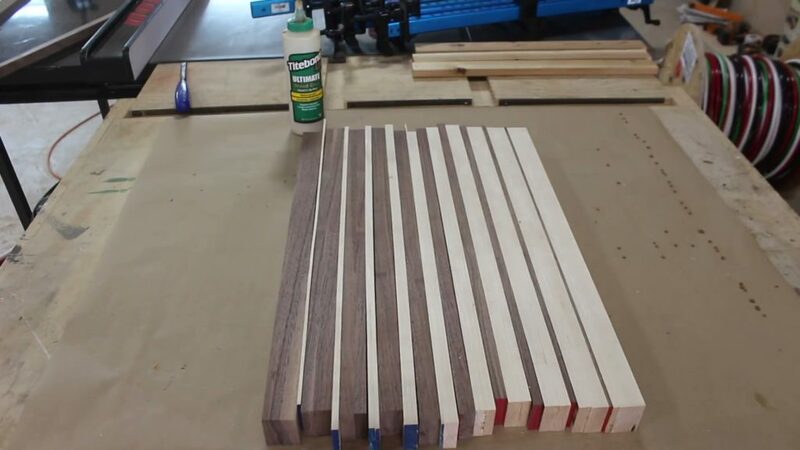 Next I glued these strips together by applying glue to the face grain of the pieces so that the edge grain will be facing up and down. I’m using Titebond III for this project as it’s water proof. Now it’s worth noting that if I had bought thicker stock I wouldn’t have had to do this step. 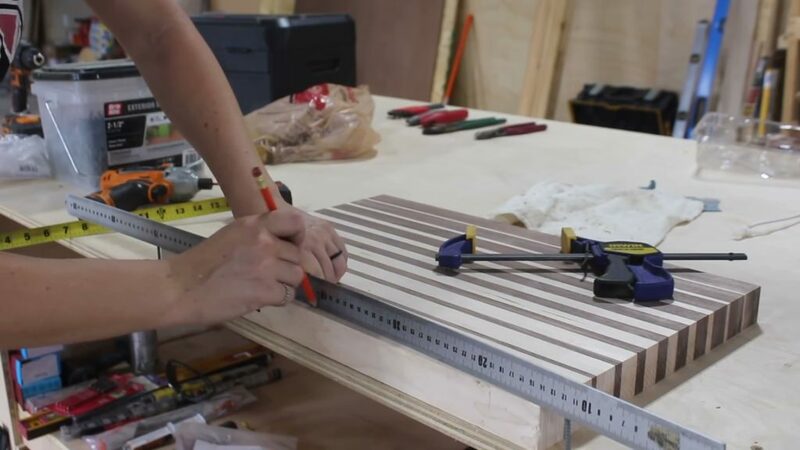 To move through this project quicker, you can buy wood that is at least as thick as the widest strip you want in your cutting board. For example, since my widest strip is 1 1/4”, I should have bought at least 1 1/2” rough sawn wood. Instead, I’m doing this glue up so that I have a massive block of edge grain walnut and maple to then cut strips from. 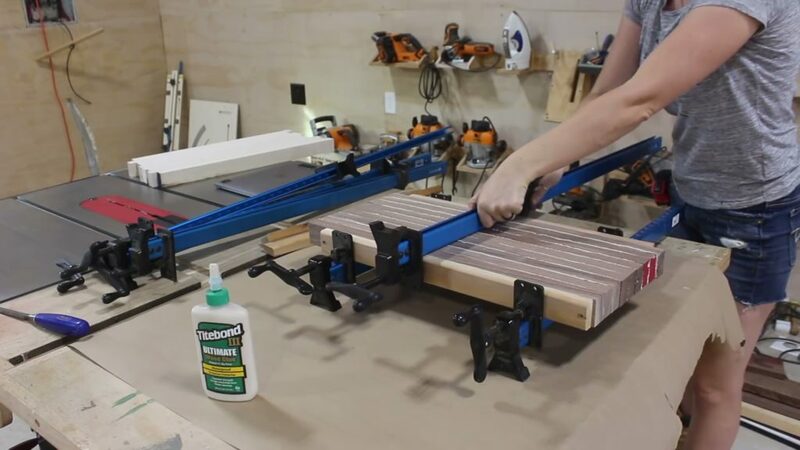 After getting my glue ups in clamps I took some water on a towel and wiped off as much of the glue squeeze out as I could before letting it set up overnight. Oh and I used some scraps wood strips on the ends of each glue up just to protect the wood from a slight indent from the clamps. These are not glued to the boards though. The next morning I took the edge grain blocks and ran them through my thickness planer to get both sides completely flat. Since I still don’t have full power out to the shop yet, I hooked up a generator to my jobsite saw and started cutting my strips. The trick with the strips is to start off with a dimension, in my case it’s 1 1/4”. Then run the walnut through then the maple to get a strip this size. Now move the fence to reduce the cut by 1/8” or whatever increment you prefer. I dropped mine to 1 1/8” then ran the walnut and the maple blocks through again. Every time I moved the fence over the same amount, 1/8” until I got down to 1/8” strips. Now I just rearranged them so that the two outside strips are the 1 1/4” strips, then moved the 1/8” right inside, then the 1 1/8”, then 1/4” and so on. You can see the effect is as the walnut shrinks in size from the left to the right, the maples grows the same amount. Pretty cool huh? Once I double checked that none of the strips got out of order, I got my Rockler bar clamps ready and did the final glue up. This glue up was a little more time consuming as each strip was a different height so the glue had to be placed and smeared individually. Again, I’m using Titebond III for this. 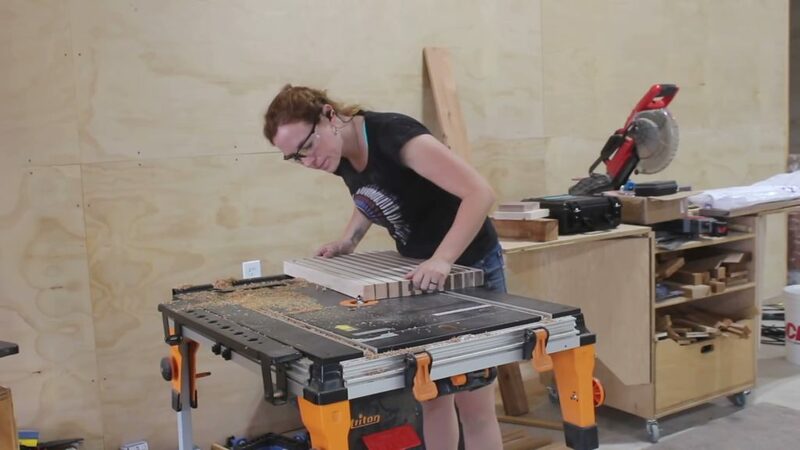 After letting that sit up over night I grabbed my crosscut sled to cut the board down to it’s final size. 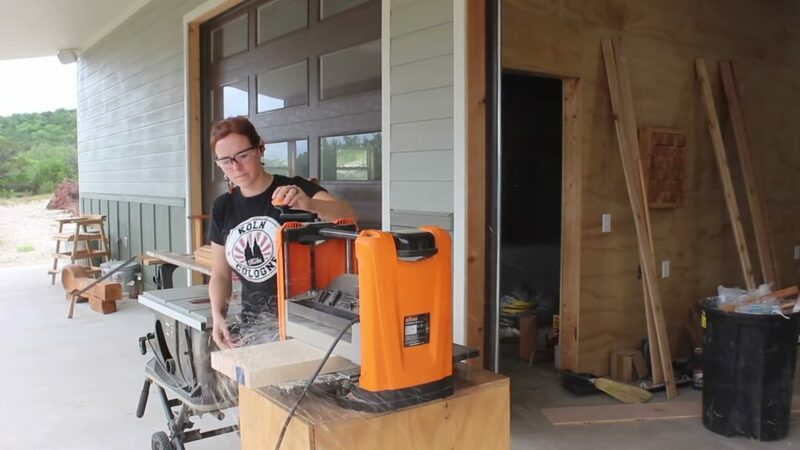 I once again knocked on my neighbors shop to use his larger thickness planer as the cutting board was now too large to run through my 12” bench top planer. Once I got both sides nice and flat, I took it back to my own space. Now you can call the board done here if you’d like, it’s still very pretty as it is. However, I thought it looked a tad plain so I played around with adding a few curves to the body. I first drove in some screws to my workbench then used a flexible ruler to trace out a nice subtle curve. I repeated the shape on the other side then took it to the band saw to cut. This came out alright but it wasn’t perfect as the cut was made free hand. I did what I could to clean it up at the spindle sander. I also wanted some curves on the top and bottom of the cutting board but first wanted to cut in the handles on the sides while they were still square. To do this I used a straight bit in my router and made three passes to get to the depth I wanted. I again did this cut free hand and while they came out okay, I learned my lesson and would definitely recommend using a template to make it cleaner and quicker! After cutting done with the router I came back with a chisel and mallet to square the corners. When moving to the cut in the curves for the top and bottom I actually took the time to make a template, and I will tell you that using a template made a huge difference in speed and final look. I made my template from scraps laying around the shop. I used double sided tape to attach the curve to my cutting board, flipped it all upside down and used a flush trim bit to make the cut. The bearing of the bit rides along the template making the edge of the board match the curve I wanted perfectly. if you’re interested I do have these templates available HERE. 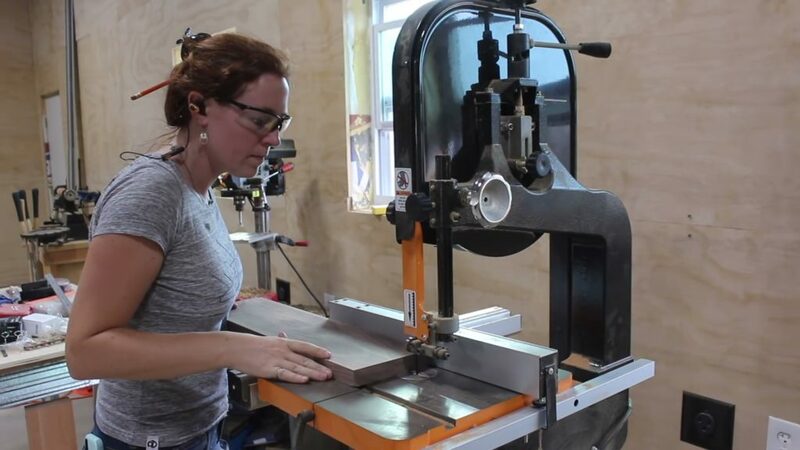 The template package includes CNC cut templates for the body curves, the handles, as well as making the juice groove which you’ll see in the next step. Before moving on I used my palm ROS to round over the sharp corners just by moving my it back and forth a few times. Ok next was a little bit of a tricky part. I wanted a juice groove in my board, you know that mote some boards have to catch juices so they don’t spill onto your counter? 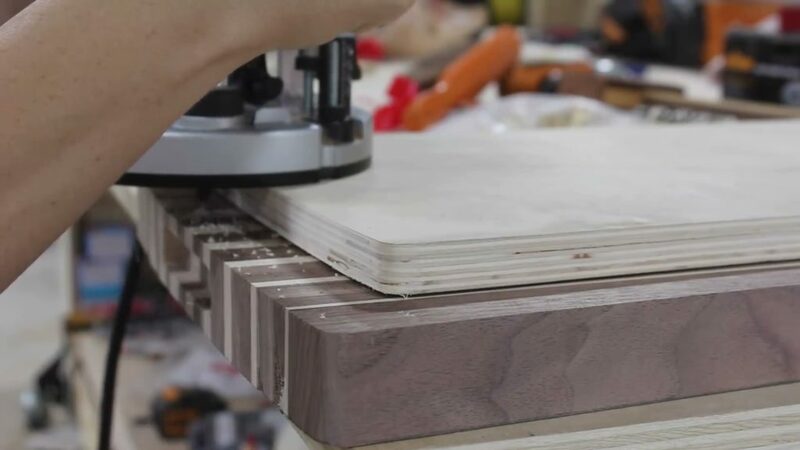 There are plenty of tutorials on making this cut when your board is square, but not any on making one with an irregular shape. So I improvised. I cut off some cardboard bigger than my cutting board then traced the shape onto it. Next I came in a little bit on all sides and used my board to trace more lines. I’m essentially making the same shape as the board, just smaller. I’ll use this as a template or guide for my router to make the juice groove. Once I liked the shape and size in cardboard I made the template from scrap wood. Once again using double sided tape to stick it to my cutting board, making sure it was nice and centered before I made the cut. I’m using a 3/8” round nose bit and a guide bushing to make this cut. I took my time and made sure to keep the router pressed up against this template and I’ll say that I was beyond happy with the way it came out. It’s a small thing that I know serves a function but even if it didn’t, dang does it look nice. To sand this groove nice and smooth I grabbed a Rockler contour sanding grip that was roughly the same size. And now was my absolute favorite part (not), sanding. The board was pretty smooth already since I ran it through the thickness planer so I started off with 120 grit paper then worked down to 220. 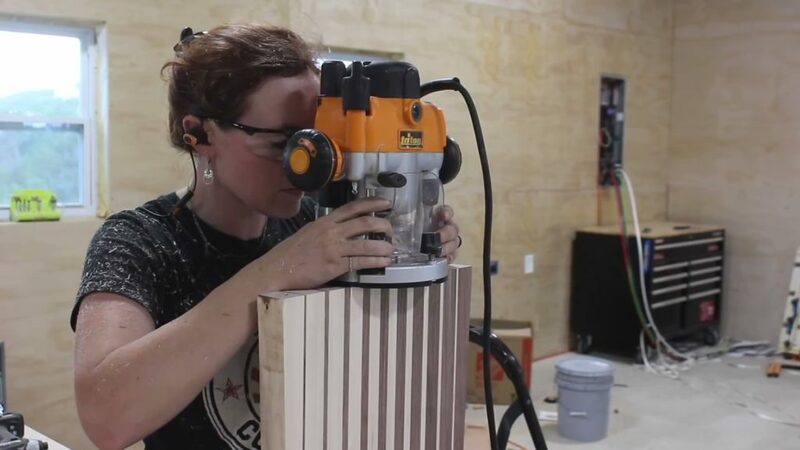 Then the final touch before throwing on a finish was to round over the edges over at the router table. I set the height of the bit then started running all edges through, completely forgetting about the handles on the sides, which meant when I got to the handle, the bearing fell into the void of it and ate into the shape of the body. As soon as I heard it my stomach dropped. I’ll be honest and say I was pretty disappointed in my mistake but decided to finish and keep the board anyways. It gives it a story, right? So moving on to finishing, I first wiped the board down with water to get the grain of the wood to raise up. Once that was dry, I lightly sanded the board using 400 grit paper until everything was baby-smooth again. 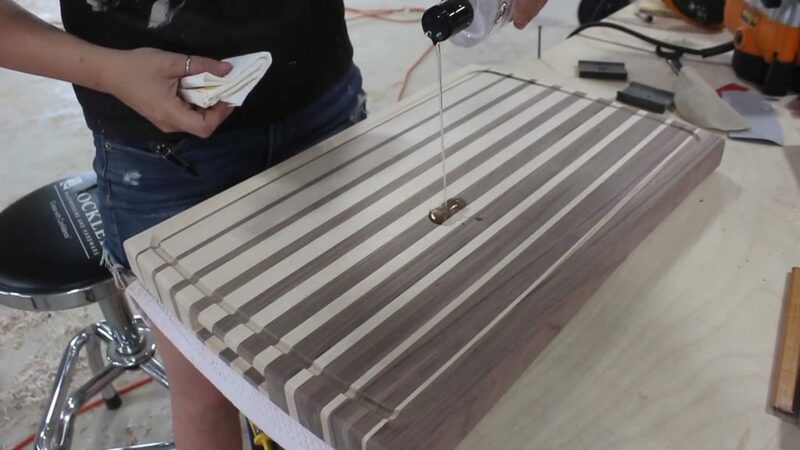 If you skip this step, then the grain will raise up the first time your board gets wet, and it won’t feel smooth. For a finish, I used standard cutting board finish since it’s food safe and won’t go rancid. I applied 3 coats right off the bat using a paper towel to spread it around the board, it’s edges, and the juice groove. Even with my little hiccup, I am completely in love with how this came out. If you’re interested, I do have templates available for sale HERE. If you’re looking to make a batch for gifts, or for sale, these templates will help you do it must faster.